“Let no man deprive you of the prize.”​ – Col 2:18. Consider this picture. On the left we have two old people looking forward to the hope of being with Christ in the Kingdom of the Heavens. On the right we have young people looking forward to the hope of living in a paradise earth. In reference to Christians—to repeat, in reference to Christians—does the Bible speak of two hopes? The last paragraph of this study concludes: “The prize before us​—whether immortal life in heaven or everlasting life on a paradise earth—​is marvelous to contemplate.” Is this teaching based on Scripture? Granted, the Bible speaks of two resurrections. When Paul refers to “these men”, he is referring to the Jewish leaders who were standing before him in a judicial hearing seeking his death. Even these opposers believed in two resurrections, as did Paul. Nevertheless, Paul’s personal hope was to achieve the resurrection of the righteous. So why would Paul say that he had “hope toward God…that there is going to be a resurrection of…the unrighteous” if he wasn’t hoping for that end himself? The love of Christ was in Paul as it should be in all his followers. Just as God does not wish any to be destroyed, Paul, secure in his own hope, also hoped for a resurrection of unrighteous ones. This was not a guarantee of salvation, but it was an opportunity for such. Jesus said: “But if anyone hears my sayings and does not keep them, I do not judge him; for I came, not to judge the world, but to save the world.” (Joh 12:47) Judgment day is yet future, so those who have died—even those who have heard Jesus sayings, but not kept them—are not judged unworthy of the opportunity of life. There is a hope for such unrighteous ones. Many of these will be those who call themselves Christian; who hear Jesus’ sayings, yet do not keep them. Here’s the problem: The Bible doesn’t teach this earthly resurrection of righteous other sheep. With that in mind, let’s look at all the evidence provided in this article to support the idea that the other sheep of John 10:16 are not part of the anointed followers of Jesus, the children of God. To be clear, we’re dealing with finding proof that everyone depicted on the right side of the opening illustration is envisioning a legitimate hope as they picture their prize. The other sheep have a different hope. They look forward to gaining the prize of everlasting life on earth​—and what a happy prospect that is!​—2 Pet. 3:13. Peter is writing to the “chosen ones”, the children of God. So when he refers to the “new earth”, he is referring to the domain of the Kingdom. (The “dom” of Kingdom refers to the domain of the ruler.) There is nothing in his words to suggest he is speaking of a hope for the other sheep. That is simply going way beyond what is written. Let us review the three scriptural references in this paragraph used supposedly to support the idea of two prizes. The Bible is for all Christians. If there are two classes with two different hopes, and if the second class outnumbers the first by about 100 to 1, then why would Jehovah inspire Paul to tell these ones to focus on heavenly things, not earthly things? The holy ones are the anointed children of God. So these words are directed to those whose “hope…is reserved…in the heavens.” They “heard about this hope through the message of truth of the good news.” So what part of the good news speaks about an earthly hope? Why does Paul only talk to the tiny flock of righteous ones who inherit the kingdom and ignore the much vaster flock of righteous, but earthbound, kingdom subjects—unless no such distinction exists? Shouldn’t Paul be talking about the prizes? Plural? Why does he only refer to one prize if there are two? Again, only one prize is mentioned. The Bible speaks of children inheriting. Friends don’t inherit life. So Peter couldn’t be talking to the other sheep if we considered them to be only friends of God. It is far more likely that Peter considered the other sheep to be holy anointed Christians who came from a gentile background. Even in Watchtower publications, the “chosen ones” are recognized to be the children of God with the heavenly hope. So these verses don’t prove there is a secondary group with an earthly hope. He’s speaking of those called who make up the one body, the body of Christ. This only refers to the anointed, even by JW doctrine; so again, no proof here. Here, lines are blurred to try to fit a scripture intended for anointed Christians into the JW concept of other sheep as friends of God. In this case, the theme text may have special meaning for you. Let us read it with some of its context to see how it might apply to us as Jehovah’s Witnesses. Do not let anyone who delights in false humility and the worship of angels disqualify you with speculation about what he has seen. Such a man is puffed up without basis by his unspiritual mind, 19and he loses connection to the head, from whom the whole body, supported and knit together by its joints and ligaments, grows as God causes it to grow. 20If you have died with Christ to the spiritual forces of the world, why, as though you still belonged to the world, do you submit to its regulations: 21“Do not handle, do not taste, do not touch!”? 22These will all perish with use, because they are based on human commands and teachings. 23Such restrictions indeed have an appearance of wisdom, with their self-prescribed worship, their false humility, and their harsh treatment of the body; but they are of no value against the indulgence of the flesh. 1Therefore, since you have been raised with Christ, strive for the things above, where Christ is seated at the right hand of God. 2Set your minds on things above, not on earthly things. 3For you died, and your life is now hidden with Christ in God. 4When Christ, who is your life, appears, then you also will appear with Him in glory. By telling Christians to focus on earthly things as depicted in the opening illustration, the Organization is undermining this divine direction. But it is worse than that. The reference is rather to the profound reverence; the spirit of lowly piety which the angels evinced, and to the fact that the teachers referred to would assume the same spirit, and were, therefore, the more dangerous. They would come professing profound regard for the great mysteries of religion, and for the incomprehensible perfections of the divinity, and would approach the subject professedly with the awful veneration which the angels have when they “look into these things;” 1 Peter 1:12. Are we aware of such teachers today? Ones who become puffed up with their own understanding of Scripture, dismissing all others? Ones who claim to be those to whom God reveals his truth? Ones who have engaged in speculation over and over, only to have it fall flat in failure? Ones who have lost connection with their head, the Christ, and instead have replaced him as the voice that Christians must listen to and obey in order to be blessed? What prize is this mock humble man trying to disqualify you from attaining? Paul says it is the prize of appearing with Christ in glory. Again, who is telling you that you don’t belong to the Christ? That you have no access to the “upward calling”? Who tells you not to look at the things above, but to keep your eyes earthbound on an “earthly paradise”? You can surely answer that for yourself. While not in line with the theme we’ve developed, these paragraphs are worthy of note due to the hypocrisy they represent within the community of Jehovah’s Witnesses. Here, Bible counsel is directed at spouses with unbelieving mates. This is all fine direction because it comes from God’s Word. Essentially, a Christian should not abandon his or her mate simply because they are unbelieving. In Bible times, that could mean the mate might be a rabid Pharisaical control freak, or a licentious pagan reveler, or anything in between, moderate to extreme. In any case, the believer should remain because if nothing else, their children would be sanctified and who knows but that one might win over the mate. It was the unbeliever who was more likely to abandon his or her mate. For the most part, this counsel is followed among Jehovah’s Witnesses except when the “unbeliever” is considered an unbeliever because of leaving the Organization. In these cases, the one who has awakened is actually more of a believer in Christ than the Witness, but the Organization doesn’t view it that way. Instead, the loyal JW is allowed, sometimes even encouraged, to disregard all the Bible direction on the matter of spousal submission and loyalty, and walk out on the marriage. Thank you so much Meleti. Once again, a triumph of truthful loving principles over human thinking & rules. I especially appreciated the reference to John 12:44. If our Lord & Leader doesn’t judge those who do not keep his word, why would we? And why blindly submit our faith to those who set themselves above the Christ by doing just that? I too was immediately struck last week & this by articles supposedly based on Col ch 2 as basis for avoiding “worldly” influences when the context is clearly speaking of such from within the congregation, those who presume to judge & make arbitrary rules for fellow heirs of the free gift. He had already complimented them in ch one for breaking free from Satanic influences of the world. I can’t believe the article would specifically exclude Col 2:16-18 from “problems that exist down to this day” wow!! My heart goes out to you as I envision you touring America after the loss of your beloved while maintaining this website. As has been said since your website began, everyone appreciates the kindness that exists among all gravitating toward this respite of spiritual refuge. Since we are all at different stages of spiritual growth, awakening each other to the call of the spirit is not ours to decide. Personally, I think this was what Jesus meant while responding to Nicodemus’ question in John 3:1-12 about being ‘born again’ to a spirit that like the wind that ‘blows where it wants to.’ As Jesus said, we might ‘hear the sound of it’ but we ‘do not know where it comes from and where it is going’ since it will only reveal to us ‘heavenly things’ when we are ready. I could almost hear Jesus’ astonished voice, “Are you a teacher of Israel and yet do not know these things?” Was the child within Nicodemus being called out to stop stifling the Torah in favour of the Talmudic teachings of the Pharisees risking expulsion from among his peers? Rebirth was his only choice according to Jesus. After all, how can we grow spiritually without becoming the children he loved? Fifty years ‘in the truth’ has taught me that much. Now, I can only pray for the children I’ve raised into it! Thanks, Smoldering Wick. That’s the best explanation I’ve read so far as to what Jesus meant by his illustration of the blowing of the wind. The picture is also a problem, Meleti has explained before that visual media short cuts a persons thinking processes. 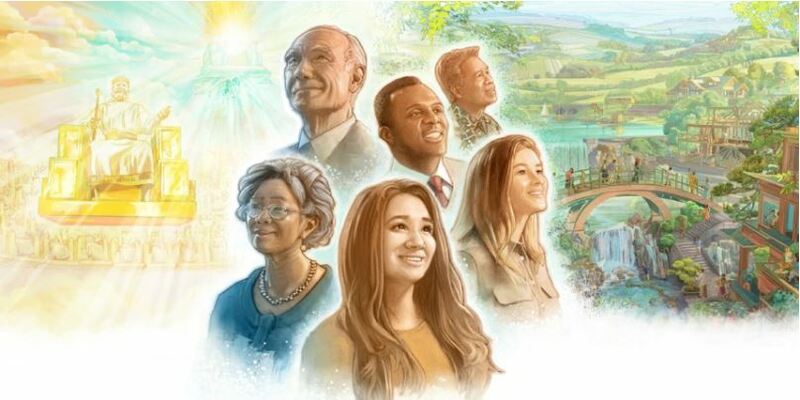 So that picture says that only old people have any hope connected to life with Jesus in heaven , even though he said the kingdom of heaven belongs to those who are child like. Meliti, thank you so much for the extraordinary work you are doing. It is clearer and clearer that the Greek Scriptures were penned for all of us, and the suggestion that they are basically written to the anointed is unsupportable. After all if the gospels and books which follow were only for the anointed, then how could we ever know which to apply and which not to apply ? Of course, some will be going to rule with Jesus Christ. Exactly how and where we shall have to wait and see, in line with recent comments on Revelation 5:10 (Where the word over seems to be an incorrect translation). As regards your addendum, have you (or anyone on the site) ever experienced their elder’s tacit approval of a spouse leaving his/her partner solely because of their being disfellowshipped or similarly sanctioned for “apostasy” ? And thank you, brothers and sisters, for the comments you have already added. Hi Leonardo, in response to your addendum question: Yes, I have experienced it. I know of two cases firsthand where the elders have actively encouraged a sister to leave a loving provider simply because he no longer agreed with the Governing Body. They don’t see this as a violation of 1 Cor. 7:14. Hi Leonardo, I came across Acts 26:18 where Paul is stating Jesus’ words about why Paul has been chosen. To give them (the nations) an “inheritance among those who are sanctified by faith in Me.” Contemporary English Version. All Christians who have faith in Jesus are holy. Nothing was noted by Paul, where Jesus indicated, that I can see as a demarcation between anointed and not anointed. Thanks Meleti for this article. It’s amazing how many false premises have to be unraveled to actually discuss the point, kind of reminds of the trinity and it’s many wrong premises. I find it amusing to myself now that I accepted the idea of three different resurrections, still can’t figure out how that slipped past, it really is obvious there are only two. ” grown ” to perfection , ( another false premise) and you have to put up with them no matter what , I wonder if it will feel like a prize then ? It seems to me that Charles Russell had a bit of a hang up about “classes” of Christians, probly a residue of post colonial British aristocratic thinking , it’s a shame that Rutherford turned it into “truth”. Some of the Bible Students that I spoke with actually acknowledge there are two hopes , yet encourage both to partake, quite interesting, maybe the GB might copy that in the near future. Hello there. I agree with you that Russell emphasized much on ‘classes’ of Christians. It was more of a way of thinking or how to interpret the little flock and other sheep – two ‘classes’ who have separate outcomes of the ‘exercising their faith’. The scriptures say there is one hope a Christian has. A Christian is to pursue that ultimate hope and outcome without prescribing themselves or others what class they belong to, rather what their GOAL is. It is true that Bible Students believe that there are two resurrections, heavenly and earthly… the earthly resurrection is for the world of mankind (righteous and unrighteous), the benefit of the ransom for all. It is not the Christian ‘one hope’… However, all Bible Students, who made a consecration, (not just associated) are running for the high calling, what the Lord will assign one or the other is not up for us to say. A consecration means dedicating and sacrificing their earthly life (and would be eternal life), following the footsteps of Jesus Christ, to be at the Lord’s service in heaven. Russell never encouraged nor spoke of an “Earthly hope” for true Christians. Rutherford created his ‘earthly class’ and made it a doctrine, formally introducing it in 1933 when he changed the name to Jehovah’s Witnesses. Well written, the title of the study under review is a tragedy for Christians who desire to come to know their father however are told , no you are only a friend. The closing song, 31 says “Rejoice that he is your Friend.” Through Christ he is your father. Jesus many times said through Matthew chapter 6 “your father”. Thank you for your insightful analysis. It goes very well in line what the early Watchtower writers believed. Even Pastor Russell himself! Let no man beguile you from the prize by voluntarily (without reason) submitting to and reverencing as messengers (of Truth those who thus far have given no evidence of teaching ability in that God never sent you any message through them). They are merely intruding into what they admit they have not seen. Their fleshly mind being vainly puffed up they fail to hold the Headship of the Lord and the membership of the Church as his Body. They fail to recognize that “God hath set the various members in the Body of Christ.” Hence they fail to see that the “Body” having nourishment, eating of the living bread and drinking of the cup, is knitted together and “increaseth with the increase of God.”—Col. 2:18,19. I have a longer reference but dont want to copy and paste it. For those who have access of the Reprint WTs see R3613 p. 248 “NOT HOLDING THE HEAD.” It is very hard hitting. “THE APOSTLE warns us all against a wrong attitude which at all times has more or less threatened the body of Christ, in its larger gatherings as well as in its little handfuls;—he warns us against the danger of looking too much to ourselves or to other men in the Church and not enough toward the Lord, who is indeed “the Head of the Church, which is his body.” Some members he represents as taking a head position, forgetful of the fact that “one is the Head of the Church, even Christ,” and inclined in consequence of this forgetfulness to think too highly of themselves, to imagine that the whole weight and importance of the Lord’s cause devolves upon them, and to assume too much leadership.